Today's review is of another Newbery Medal winner, I Juan de Pareja by Elizabeth Borton de Trevino, which received the award in 1966. When Juan de Pareja's mistress dies, he is inherited by the famous Spanish painter, Diego Velasquez. Over many years, Juan and Velasquez become great friends, and Juan witnesses many important moments in the life of his famous master, all while painting his own works in secret. While most details of this story have been fabricated, it is based on known facts about Juan and his artwork. Unlike many other children's books, which focus primarily on their protagonists' childhoods, this book is a portrait of the entire duration of Juan's relationship with Velasquez, much of which occurs during Juan's adult years. This unique approach allows the reader to gain a full sense of Velasquez's career as an artist, and also to see the ways in which the two men influence each other, as people, and as painters. 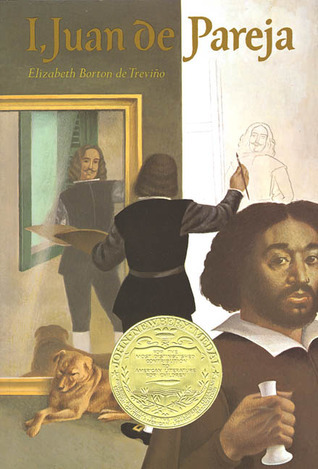 Similar to The Second Mrs. Gioconda, which allows the reader to get to know da Vinci through the eyes of his apprentice, this book allows the reader to see the vulnerabilities and emotions of Velasquez by giving insight into his closest relationship. For readers who are learning about his work, or about this time in Spanish history in general, this book provides a great way to connect more personally with the time period and people involved. What surprised me the most about this book was that it made me cry. It was such a shock because the book is written in a very straightforward way, and never tries to manipulate the reader into experiencing any particular emotions. Rather, the events of the story itself are so moving at times, that tears are just a natural reaction. I'm not sure if kids reading the story would react in the same way - maybe they don't have enough life experience yet to appreciate the beauty and rarity of lifelong friendship - but for me, it was enjoyable to experience emotion not because the author forced me into it, but because the book itself was just that good. I also loved the way religion was portrayed in this book. Juan is a devout Catholic throughout the story, and there is a scene where he must face the guilt he feels over stealing his master's supplies in order to paint his own works, and he begins to consider going to confession. The fact that the sacrament of Reconciliation actually appears in a children's novel was a pleasant surprise for me, and one that would make me even more inclined to share this book with my own kids when they are of middle school age. Similarly, I also loved learning all the details of what it was like to be the painter for a royal court, and of Velasquez's particular personality and habits. Everything in this book is interesting and well-written, which is just so refreshing! I, Juan de Pareja will be best enjoyed by older readers (grades 6 & up) who have some familiarity with the work of Velasquez.